CHENANGO COUNTY, N.Y. -- Greek yogurts are lining the shelves at grocery stores around the country. Now the product could be making its way to your child's school. "Our product has been enjoyed everywhere, every corner of the country, but we have more to do. 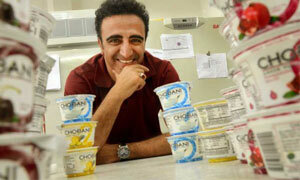 The behavior of eating yogurt starts when you are little and this nutritious product needs to be in every kitchen or every hands of everybody in this country," said Chobani President and CEO Hamdi Ulukaya. Senator Charles Schumer is urging the U.S. Department of Agriculture to revise its school lunch and breakfast guidelines so that they reflect the nutritional content of Greek yogurt. Currently, school meal programs consider Greek yogurt to be the same as regular yogurt and designate the same serving sizes for both. "This blanket rule for all yogurts creates a serious issue for Greek yogurt, as it doesn't account for the difference that Greek yogurt is a more nutritionally dense product, it has two times the protein of other yogurts," said Schumer. Schumer says updating the guidelines would make serving Greek yogurt like Chobani more affordable for schools and would help provide healthier options for students. "It's a logical question. If this food is so healthy and so good to eat, why aren't we serving it to our kids?" asked Schumer. It would also provide an economic boom for the Greek yogurt industry, which is largely based in New York, including companies like Chobani in Chenango County. And New York's dairy farmers would also benefit. "It's gonna take creative ideas like this to keep the local family farms going in New York State, keep these initiatives going, it’s truly going to hopefully revitalize the whole dairy industry in New York State as we've struggled recently, it's going to take continued things like this," said Broome County dairy farmer Judi Whittaker.